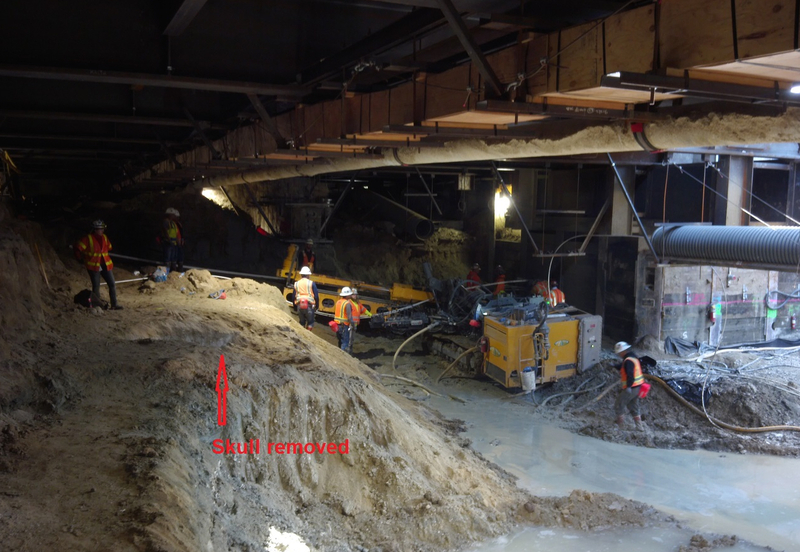 The area where the partial skull of a mammoth or mastodon was found recently at the Wilshire/La Brea Station site. 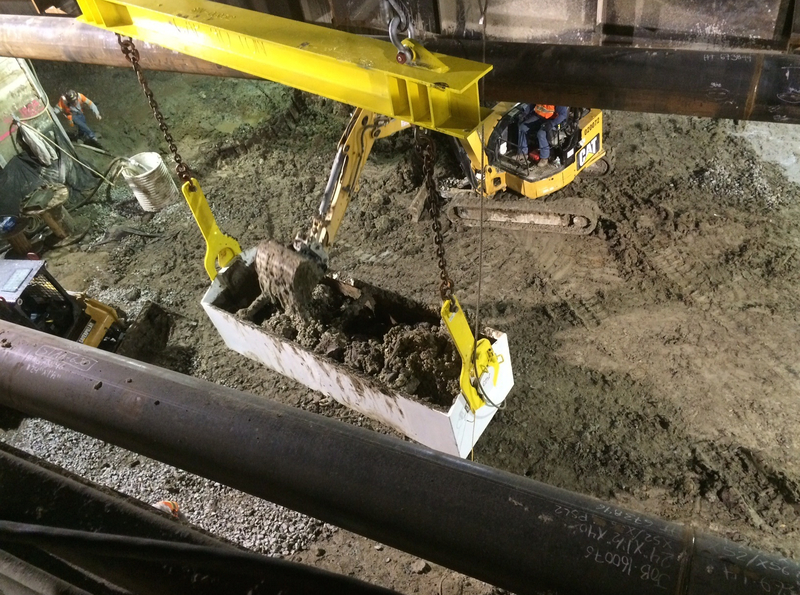 The excavation under under the Wilshire decking at Wilshire/La Brea. 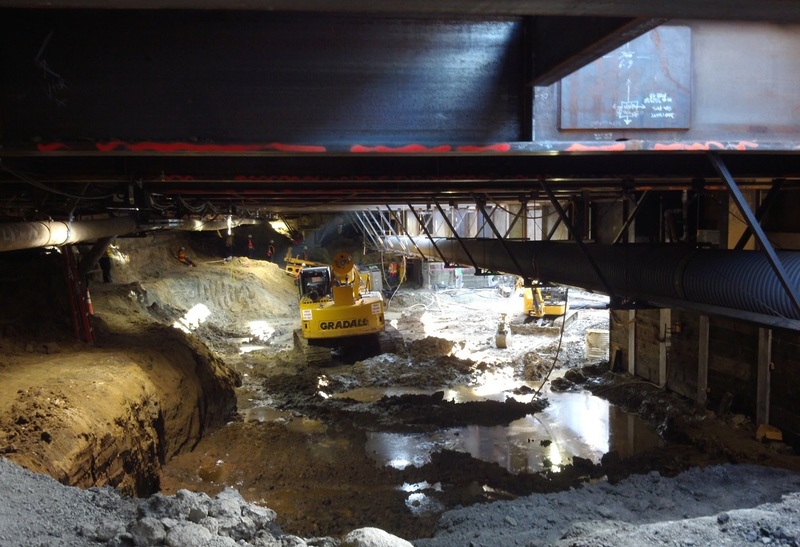 Three pretty good new pics of the working taking place under Wilshire to excavate the future Wilshire/La Brea Station for the Purple Line Extension. The first segment of the project is under construction and will stretch the Purple Line subway from its current terminus at Wilshire/Western for 3.9 miles with new stations at Wilshire/La Brea, Wilshire/Fairfax and Wilshire/La Cienega. Here’s the project home page on metro.net. The target date to have this phase of the subway in service is late 2023. The project is funded by Measure R and a federal grant. Federal funding is being secured for the second phase to Century City and the recently voter-approved Measure M will help accelerate the third phase to Westwood with a target opening date of 2024-26. So 10 years for everything to be completed? Thats pretty fast if its true..
We’ll need the federal grant for the third phase to come through but that’s the plan. What do you think the chances of that happening are with the upcoming administration that seems to be so against funding public transit? They say Mussolini made the trains run on time. 10 years for 3.9 miles is called SLOW WORK!!! Want funding? Increase bus service, eliminate some stops and money will come and traffic will be reduced. Umm yeah I wouldn’t read too much into Trumps comments there. He takes no interest in policy details and is letting his Vice President and appointees handle actual policy (the man says he won’t even receive a presidential daily briefing, because he’s “too smart”). And when we look at the types of people he’s appointing and his VP’s stances on things like public transit it’s not a very good picture, especially with GOP control of congress. I wouldn’t be surprised if we saw a new effort to eliminate public transits mandatory highway trust fund allocation (the GOP house attempted to do this back in 2011 but the idea was DOA in what was then a democratic senate, not to mention the Obama White House’s certain veto of such a measure). With the details released from the transition so far, it’s clear Trumps much hyped massive infrastructure investment plan is a massive dud to public transit advocates. With its main agenda being massive investment by private sources of revenue to find infrastructure projects; which is another way of saying it’s a privitization scheme. transportation infrastructure that is capable of making a profit is then the sole beneficiary.. public transit systems don’t make a profit, they do the opposite of that, relying on public assistance to provide the service, hence the “public” in public transportation. All fair points. What remains to be seen is whether federal transit funding stays the same, shrinks or grows. Generally speaking over the last 20 years it has expanded. In particular, keep an eye on New Starts (Section 5309) funding — those are the federal grants used to build large transit projects. It’s just hard to predict which way that funding will go. It’s probably realistic not to expect it to grow much, but hopefully it will remain stable as there are now many cities with local funding in hand and just need federal funding to build some desired projects. Advocates and stakeholders will build local support, which is key to securing federal funding. A presentation at a meeting of Southern California Transit Advocates by Jerard Wright of MoveLA encourages me economic logic can help us convince folks in DC regardless of ideology that we rate support. Fingers crossed as we enter an era of uncertainty. This project is WAY OVERDUE! They should have done this 10 or 15 years ago! !